I often struggle with finding hope in my faith, if that makes sense. I see stunning things happen through amazing faith of incredible people from the Lulu Tree and I find myself wondering why I am not seeing mind-blowing answers to my own prayers. Is my faith that small or am I not praying the right things? How do you know when your faith is big enough or when you are praying the right things? So clearly, it doesn't matter the size of your faith, it's not that my faith is too small. 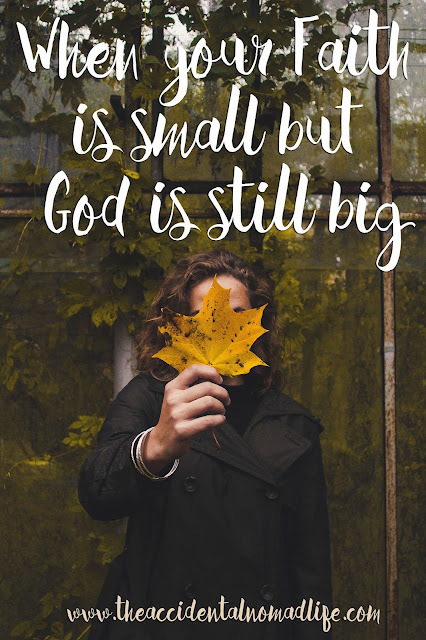 God still moves through small faith, he also moves through any prayer offered up to him. And pray in the Spirit on all occasions with all kinds of prayers and requests.With this in mind, be alert and always keep on praying for all the Lord’s people. When I am concerned about whether or not I am praying the RIGHT prayer, I remember, there is no RIGHT prayer, just a right heart in prayer. I have had it happen when I pray for something to change...We'll take my husband for example, I have prayed for him to change, or change something about him and nothing has happened. Because I was praying it selfishly, I wasn't praying it for HIM, I was praying it for ME. I noticed one time after I had called out on his behalf that things changed so quickly and I realized, after seeing the prayer answered, that I was praying in the right heart. So, when you feel your faith is the least, and your prayers are going unanswered, remember that there is no right or wrong prayer, only a right or wrong heart in prayer. That's not to say that praying things for ourself is wrong, the scenario that I used was one that I was being selfish in. I believe that prayers for our own protection (with victims of domestic abuse in mind) are totally viable, reasonable, and necessary, my prayer was one about attitude. And when you feel you have no more faith to give, that every last ounce of it is used up, remember that even faith the size of a mustard seed can see glorious things happen in His name. Thank you, Lecy! They are GREAT verses. What a blessing to have so many beautiful words that speak to our hurting souls. <3 So glad to have you along, love!